Let me introduce Ashley Cappetta to you….. 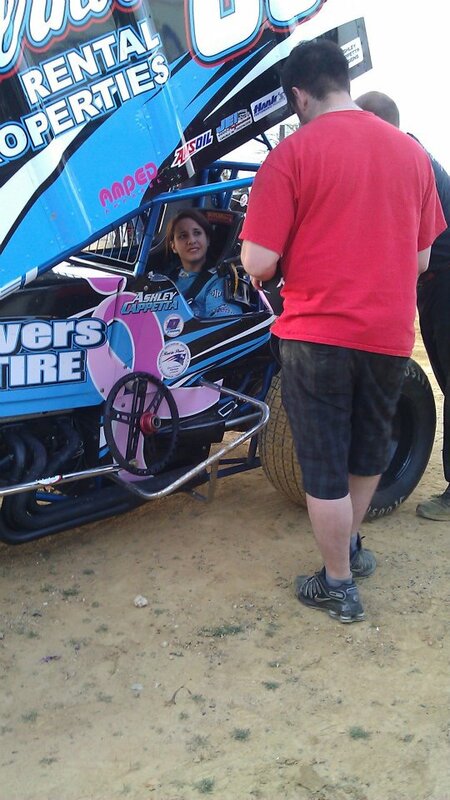 The very first time I met Ashley Cappetta, I was in the pits at Williams Grove. She was helping Brian Leppo. I think she was about 14 years old. One of the first things she told me, was that she wanted to drive a sprint car. This is no surprise to me. She lives in Central PA….the ‘hotbed’ of wing racing. She goes to school with the likes of Aaron and Amy Ott (among others). Since meeting Ashley, she has worked with other 410 and 358 sprint car teams at other racetracks (Lincoln and Trailways inlcuded) and has pursued her dream of driving a sprint car. I remember just two years ago, meeting with Ashley in her dining room and two others who wanted to help get Ashley into a sprint car. While I havent helped her as much as I wish I could, others have stepped in and made sure that Ashleys dream was kept alive. And this past Tuesday, Ashley made her ‘debut’ at Trailways. Just seeing Ashley sit in her 358 truly makes me smile. You see, she worked for every single part on that sprint car. And I am proud of her for making her dream happen! While I was at Trailways Tuesday, I saw Ashley make 3 ‘runs’ on track. Since this was her VERY FIRST TIME out on the track, she was alone on the track. Now, lets address a few things now that youve seen the video…..
Ashley understands how much these sprint cars cost and she also understands just how hard everyone has worked to get this car on the track. She went to Trailways this past Tuesday in order to get in and get comfortable in the car. She wasnt out to break any track records, nor was she out to destroy her car. I think that we, as fans, forget that our drivers start SOMEWHERE. Personally, I think Ashley did fabulous for her first time on the track. She was taking the turns quicker each time she went out. If I wasnt ‘filming’, I would have broke out the stopwatch just to confirm this. And for the ‘haters’ out there criticizing her, put your money where your mouth is. So, if you were (or are) one of those yahoos who think you could have done better…….WHERE IS YOUR CAR? One of the blogs I follow has recently been posting these 30 Days of Truth writing prompts. (See list here: http://hope.gr/30-days-of-truth/ ) I thought, what a great idea! I would like to travel to Australia one winter and see sprint cars race at Parramatta Speedway ( http://www.sydneyspeedway.com.au/ ). First, its warm in Australia that time of year….and then secondly, some of our local drivers travel over there to race. I would have to get over my issues with flying (or be severely drugged) and have a TON of cash. Cuz, if I were to go there, Id be buying all kinds of sprint car stuffs from the aussies. Ive been listening to these races for years online (I never get to hear the entire race since they begin in the middle of our night and end after Im on my way to work) but seeing them live would make me a very happy dirt track race fan chick. Everyone knows I love my dirt track racing. But there comes a time when fans and drivers have to put their foot down and teach a racetrack a lesson. Today, marks the final straw for me. This weekend was the rescheduled OctoberFest at Hagerstown Speedway. For most, this is the last race they will see until February or March when our tracks reopen after the winter off-season. Today Hagerstown ran into a complete snafu. Their promoters royally screwed up by obviously not having a plan in place for this event. After three drivers meetings, they decided to cut the features basically in half. A 50 lap sprint feature is now 30 laps and the 100 lap features are now 50 laps. One of the car owners actually stepped up to pay the purse [Ernie Davis(Josh Richards) car owner] which, is a wonderful thing in one respect, but totally wrong in another. As a driver or car owner, I would be incensed to have to pay out for the purse. This is the responsibility of the race track – NOT a car owner. As a fan, paying out $35 for a general admission ticket, I would feel completely ripped off. I mean, this isnt a regular race. OctoberFest is an event. Besides, if you pay to see a 100 lapper, you should see a 100 lapper. If you pay to see a 50 lapper, you should see a 50 lapper. Fans and drivers and car owners alike should complain to those at the track. Tell them straight out that mismanagement is one of the reasons the stands arent filled to capacity and the car counts suffer. I used to go to Hagerstown. I grew tired of watching 4 push trucks managing 20+ sprint cars, terrible food, my friends having to purchase their beverages, and idiot fans standing the entire race thinking they were at a Napcar race. And after todays complete farce, I will NEVER go back. NEVER. I dont care whos running there. I dont care if every other track closes. We will NOT be paying out our hard earned money to a racetrack that just doesnt get it. Controversial prayer? Not in Nascar land. Lets get my first thought out of the way. I know that most of the comments are completely from those who have NEVER seen a Nascar race. Do you want to know why? They are up in arms about the public prayer thing…..Dont get me wrong, I completely understand the whole separation of church and state thing, but why are you just now getting upset? As long as I can remember (and Im currently 40 years old and Ive watched ALOT of races) there has ALWAYS been a televised prayer before the National Anthem prior to any Nascar sanctioned race. ALWAYS. So, your argument is moot. Unless you can prove to me that youve been fighting this since Nascar began…..there is no argument to be made. Secondly, Pastor Nelms prayer is NOT disrespectful. He didnt say this prayer in church. He said it at a racetrack. Again, those who are pointing out his call-outs to sponsors, manufacturers and other various race related things, it is blatantly obvious you know NOTHING about racing. Without sponsors, there would be no racing, which is why the first thing drivers do when they win, is call out every sponsor they have – as well as their manufacturer. Thirdly, his ‘in the name of Jesus-boogity, boogity, boogity-amen is NOT disrespectful either. You see, when the green flag drops and racing begins, Darrell Waltrip says this. It is a way to say….woohoo its on! Its basically the equivalent of shouting ‘hallelujah’ in church. Lastly, Ive seen alot of comments regarding his ‘for my smoking hot wife’ quote. Quite honestly, its refreshing that this man loves his wife this much. And in case you were wondering, his wife aint no supermodel. Below is a picture of them together. 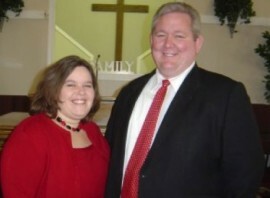 And before I close out this blog post, Im disappointed in those who have judged this Pastor, as well as Nascar and their fans based on an Invocation that they didnt even realize occurred in the first place. As Ive mentioned to many of my friends and acquaintances this past week, Nascar is the ONLY sport to televise their Invocations WITHOUT the big mouth announcers talking over them. I have spent a good amount of time at the dirt track….Im guessing most of you already knew that. Alot of people dont understand why I am so addicted to it, but its not *just about the racing. Its everything. I love getting to the track before gates open. I like to prepare what Im taking in with me. Once the gates open, I put my stuff down and literally watch the racetrack come to life. If you have never done this, I suggest to do this at least once….no matter where you choose to watch from. Theres nothing like seeing an empty pit area fill up, hauler by hauler….team by team…and seeing the fans stream in. It truly is a wonderful sight. *SHARING / GIVING – Did you know that many teams share tools? Did you know that many teams will help another team in the pits? Yes both of these statements are true. Ive seen many teams lend all types of things to other teams in the pits. You know, helping a competitor out doesnt mean youre giving him all your secrets! LOL Did you also know that outside of the track there is a community? No, Im not talking about the community where the track is located…..Im talking about campers! There has been many a night that Ive partaked in eating a burger that someone has given me. (by the way, thanks for that) Without all this sharing and giving going on, the ‘spirit’ of racing would be much-much different. *FORGIVENESS – Sometimes we really make others mad at us. Sometimes we are mad at others. Either way, you need to forgive them. It doesnt matter if you are a driver or fan….we all need to share the racetrack. If you are a competitor, sometimes you make a mistake. In a split second, you need to decide to either apologize or become a jerk. The other party has to decide whether to forgive you or well, become a jerk. As fans, we encounter all kinds of stuff….whether its having a drink spilled on you or your stuff or having someone park in your camping area, etc. We need to find assertive ways to address these situations because more than likely, this situation will present itself to us again OR we will encounter these people again. *SUPPORT – This topic covers a multitude of things to say. Ill begin with the obvious…..supporting our community family. Dirt track racing is the only thing I know that does this completely right. I have never before in my life seen another venue where it doesnt matter if you liked someone or even knew them, if there is a loss, we ALL come together to support the family and friends. This not only covers drivers, but fans as well. We (as fans) help drivers by purchasing their merchandise. Did you know that some drivers pay for their insurance with that money? And and for those outside of the sport, did you know that drivers will pass the helmet for other drivers who are injured? What this means is that a driver will walk into the grandstand area carrying his helmet. Fans put the money in the helmet. This money goes to the injured driver fund or to the injured drivers family for expenses. Oh, and by the way, almost ALL the fans will clap for a driver walking thru the grandstands….even if they boo him on the racetrack. Alot can be discussed amongst the above categories and this isnt an end-all-be-all list by ANY means. And, of course I hope to continue to learn and to continue to see good things happening at the race track. Until then……keep your elbows up! Once upon a time there was a sport that had ravenous fans. Back in those days, drivers had personalities and the stands were packed. But that was then…..this is now. About 10 years ago, Nascar decided that it wanted to be like other sports and institute a ‘play-off’ system. This created a change in their points system and a created the ‘chase’ out of the last 10 races of the season. Now, Nascar claims that this change in points would not change who won the championship….and while that may be true, there are many things that this did affect within the points system. One being that usually drivers who finish in the top 10 positions would have better sponsorship opportunities. With this ‘new’ system whoever finished in the top 12 positions would be ‘locked in’ and couldnt finish worse than 12th in points, no matter how they ran in those last 10 races. Prior to this change, anyone could have finished in the top 10 and have additional opportunities. Now, cut to the present…..
Nascar has claimed this ‘have at it boys’ attitude and well, that sounds good on the surface, but apparently they are all talk and no action. Lets be honest….in Nascar drivers arent allowed to have personality. Drivers have no say. A driver isnt even allowed to be honest after being asked to do so. When Nascar brought out the ‘car of tomorrow’ they asked the drivers their opinions. One of them gave his opinion and was fined according to all the blogs Ive read today. I dont even like the driver that this involved, but come on!!!! Dont ask a question you dont want answered Nascar. And not that anyone affiliated with Nascar will ever read this blog post, but to keep the drivers who you fined a secret? How lame is that? Are you afraid that the fans will turn on you more because of your stupidity? Now, Ive been a race fan for a very long time, but when you change the sport in the way that you have, you lose the fans who grew the sport….Whats more important Nascar? Bringing in new people who dont know the history or keeping the fans who have attempted to keep watching despite your idiocy? Some people may disagree with me, but I know at least 50 people who wont even watch a Nascar race any longer…..including myself. Im a dirt track kinda gal and I know alot of sprint car drivers, and those drivers and their families design their own merchandise. Alot of those drivers use the money raised from tshirt sales to pay for their health insurance. Now thats something I can and will continue to support….I wont be spending my hard earned money on a sport that could care less about the fans.